#2 BU is in Hamden, Connecticut today to take on #14 Quinnipiac in the third-ever meeting between the Terriers and Bobcats. Puck drop for the afternoon contest is at 2 p.m. with a livestream available on ESPN3. The Bobcats, whose line-up includes two transfers from BU, defenseman Brandon Fortunato and forward Kevin Duane, opened their regular season on Friday with a 1-1 overtime tie at Boston College. Alex Whelan scored Quinnipiac’s goal that was matched by the Eagles late in the third period. Goalie Andrew Shortridge stopped 25 BC shots. Top returning scorers for QU are forwards Landon Smith (29 points) and Craig Martin (27) and defenseman Chase Priskie (26), a Washington draft pick. Shortridge had a 13-7 record last season with a 2.08 GAA and a .920 save percentage. ► Bernie Corbett’s Hockey on Campus podcasts will air again on NHL Network—Channel 91 on Sirius/XM. He looks at the season ahead with guests Nate Ewell of College Hockey Inc., Adam Wodon of College Hockey News, Dave Fischer of USA Hockey and Mel Pearson, who has succeeded Red Berenson at Michigan. 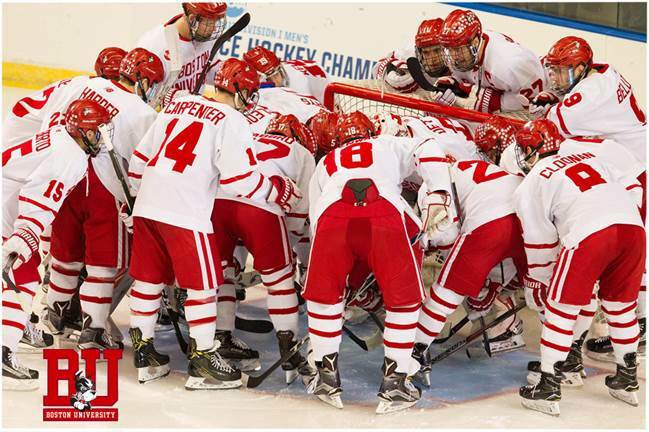 Hockey on Campus podcast also can be found on the College Hockey News Website. 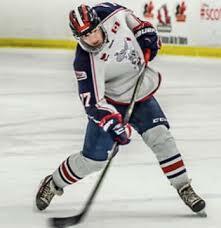 A pair of future BU blueliners, 2019 recruit Case McCarthy (photo) and 2020 recruit Alex Vlasic, each contributed two assists as the NTDP U17s outscored the Chicago Steel, 8-5. 2019 recruit Robert Mastrosimone scored his first USHL goal for the Steel. 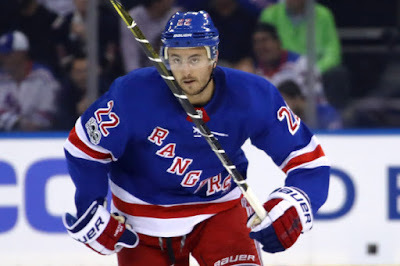 Kevin Shattenkirk scored his first goal as a Ranger (video), but Toronto came away with an 8-5 win after the Blueshirts had rallied from a 5-1 deficit. Jack Eichel scored his first goal of the season (video) and added an assist for the Sabres who were doubled up by the Islanders, 6-3. Danny O’Regan, last season’s top scoring AHL rookie, is off to a hot start, with a two-goal, one-assist effort to lead the San Jose Barracuda past Stockton, 6-4. Jakob Forsbacka Karlsson registered his first two AHL points, a goal and an assist, to lead Providence to a 5-2 win against Springfield. Nick Roberto scored a pair of goals in his second ECHL game leading South Carolina to a 3-3 tie against Greenville. Roberto’s second goal was assisted by Robbie Baillargeon. Tommy Kelley scored his first professional goal, putting ECHL Manchester on the board first in what would be a 4-3 win for the Monarchs over Worcester. Terriers fell to #8 Northeastern, 6-3, at Matthews Arena on Saturday. Terriers drew first blood on Junior Mary Grace Kelley’s tally at 5:15 of the first, but the Huskies scored the next three goals to take a 3-1 lead eight minutes into the second. Senior Savannah Newton’s first career goal was matched by another Northeastern score for a 4-2 lead after two. In the third, senior Victoria Bach split two defenders and deked the goalie to bring the Terriers within one, but Huskies would add a power play goal and an unassisted goal to close out the scoring. 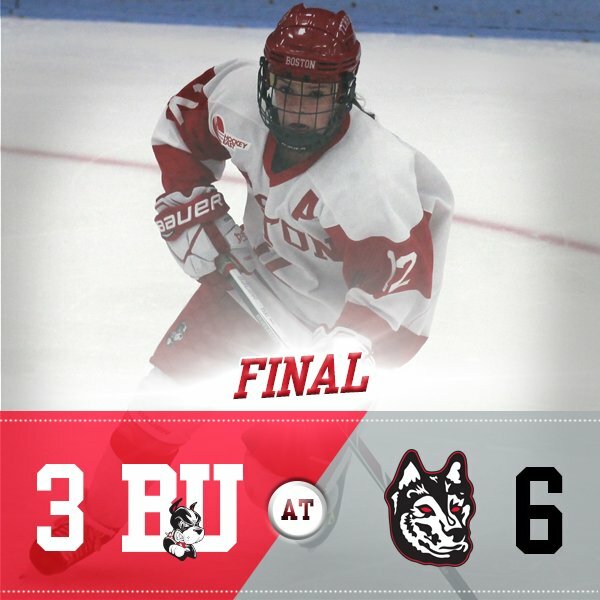 Senior Erin O’Neil turned aside 34 shots as BU fell to 0-3.